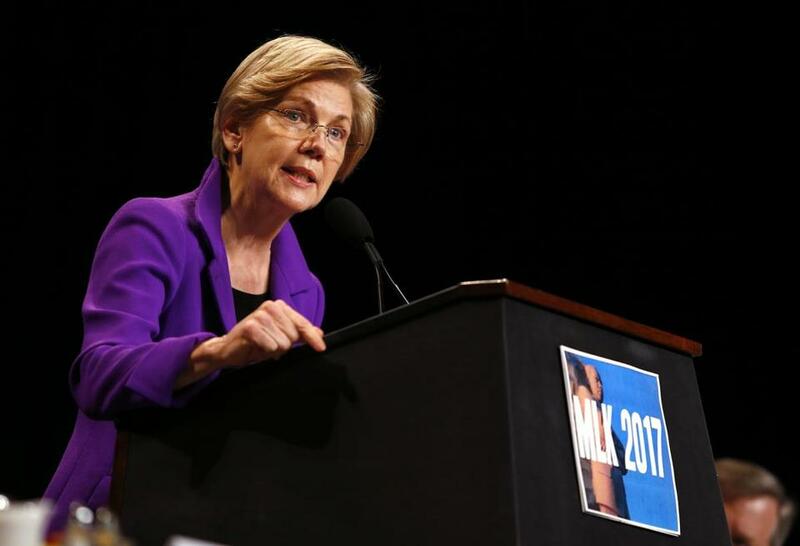 Senator Elizabeth Warren spoke during the annual Martin Luther King Jr. Memorial Breakfast earlier this year. How does a hearing aid bill turn into a fight about gun rights? By having Elizabeth Warren as a lead legislative author, apparently. Warren has teamed up with several Republicans on legislation creating an over-the-counter category of hearing aids, which proponents believe would lower prices, spur innovation, and help millions of people with mild-to-moderate hearing loss obtain devices and improve their lives. As few as one in seven of the estimated 30 million Americans with hearing loss gets aids, experts say, and a big reason is their high cost. The hearing aid industry is against the bill, but in recent weeks, opposition has emerged from less expected places: gun owners and a slew of conservative groups. The backlash appears to be rooted less in the substance of the legislation and more in the fact that it’s Warren — a senator increasingly targeted by Republican groups — who is behind it. A gun owners group argues that the legislation would impact hunters who purchase hearing enhancement devices as a way of better hearing their quarry. This, they say, is an infringement on their constitutional rights. Despite assurances from the bill’s authors that it would not affect devices used by hunters, they say, Warren cannot be trusted. Like the gun owners, a coalition of conservative groups in letters and op-eds describes the hearing aid legislation as the creation of Warren’s — ignoring that she has cosponsored it with Republican Senator Chuck Grassley of Iowa and that the lead cosponsor of the House version is conservative firebrand Marsha Blackburn of Tennessee. “Senator Elizabeth Warren’s proposed legislation . . . is just another big government ploy to create more regulations and aid corporate rent-seekers while harming consumers by limiting their choices and driving prices higher,” the coalition of close to two dozen groups wrote in its own letter to lawmakers. The six big hearing aid manufacturers, which have a lock on the market, and some hearing specialists have been critical of the legislation from the start. They warn it is dangerous to encourage people to self-diagnose hearing loss and it’s important to have professionals involved in the process of diagnosis and fitting hearing aids, as required by current rules. Warren, joined by Grassley and others supporting the bill, argues that the intended purpose of the legislation is to reduce the amount of government involvement. They say creating a class of over-the-counter hearing aids to be regulated by the FDA would sweep away outdated state rules that are stifling innovation and keeping cheaper devices from consumers. The situation is a window into just how much animosity Warren inspires on the right. It also raises questions about the extent to which such political animus will get in the way of Warren trying to notch substantive legislative accomplishments. Her term has been marked by several successes stopping nominees she disagrees with and by energizing and mobilizing support for her causes, but she has so far been less adept at getting her bills turned into law. Warren’s bill has attracted some new GOP support in recent weeks, and it’s moving through the legislative process — a big accomplishment in the current Capitol Hill quagmire. The hearing aid proposal has been added to must-pass legislation in both the House and the Senate to reauthorize the Food and Drug Administration’s system for collecting fees from manufacturers during the drug approval process. The Senate version was recently approved in committee with bipartisan support. The House bill has been approved by a key subcommittee, winning praise from the panel’s staunchly conservative chairman, Texas Representative Michael Burgess. The House bill, which is cosponsored by Massachusetts Representative Joe Kennedy III, still needs to be approved by the full House health committee before heading to the floor. Allies of the legislation worry that if enough opposition emerges from potent groups such as the gun lobby, Republican lawmakers could decide to remove the hearing aid proposal to avoid a confrontation. The legislation has triggered a flurry of lobbying activity, with hearing aid manufacturers and some specialists who sell and fit the devices squaring off against consumer technology companies that want to get into the market and hearing-loss advocates, including AARP. Starkey Hearing Technologies, the only US-based hearing aid manufacturer, spent $50,000 lobbying on the issue in the first three months of this year — the first time in a decade the company has spent money on lobbying, according to data compiled by the Center for Responsive Politics, a nonpartisan organization that tracks political money. The Hearing Industries Association, a trade group, spent the same amount so far this year, as has Amplifon, the world’s largest hearing aid distributor (which also spent $90,000 on the issue last year). It’s unclear how much the gun owners’s group may have spent lobbying the issue. Among supporters of Warren’s bill, Bose Corp. wrote its own $50,000 lobbying check for work building support. Based in Framingham, Bose is among the tech companies that seeks to break into the market. Some heavy-hitters are backing the Warren bill, including the Consumer Technology Association, which has spent more than $1 million lobbying a slew of issues this year, including for over-the-counter hearing aids. While nearly two dozen conservative groups — including Frontiers of Freedom, Tea Party Nation, and the Center for Freedom and Prosperity — have opposed the legislation, other conservatives support it. Samuel Hammond, a policy expert with a libertarian think tank called the Niskanen Center, said he doesn’t buy the arguments that the bill is a case of big government overreach. He has written to lawmakers in support of the bill. Even though Warren may not be the only reason the groups are opposing the bill, he said, she is giving them more ammunition. Gun Owners of America has continued sending out messages to its members opposing the legislation. It has also been working with several House Republicans to add language to the bill that they believe would shield hunters. Grassley told the Globe the proposal would not impact their listening devices, and he has drafted new language to add to the bill to make that clear.